Michael and Jana were incomplete without each other. There was no room for Mars in Jana's life—or death—story. Jana was sure Michael would rush to her side soon. But things aren't going according to Jana's plan. So Jana decides to do whatever it takes to make her dreams come true—no matter what rules she has to break. My Thoughts: I started this book laying in bed one night. The next day I finished it on a long car trip. As I sat in the passenger sit, I flipped the book to its last page. I looked over to my boyfriend, and said, "hmm that was one weird but interesting book." Dead Rules was very unique to say the least. We are introduced to Jana Webster who is dead. We barely get to know her in the real world (besides her bowling accident). We are introduced right away to her as being dead. She is in dead school with other dead kids. We are introduced to all of her new friends. Honestly, I loved each one of her friends and I loved reading their stories about how they died. They were all very unique. Than, we meet her one and only Michael. Micheal is Jana's Romeo. He is the cereal in her milk. The cheese in her crackers. In other words, she loved him so much she was border lining on obsessed. Or at least it seemed that way to me! HAHA! We can tell right away that Michael just wasn't as into Jana as she assumed he was. He had his own agenda and her dying was a blessing in disguise for him (what a total jerk). Than, we are introduced to Mars. Jana is warned her very first day of dead school to stay away from Mars. He's a slider and very dangerous. (You'll get to know the different terms throughout the novel-Sliders-Risers-etc). I liked Mars from day one. Something about him was mildly interesting and attractive. Even though he is a bad boy, I could tell he had a soft inside. Jana doesn't know it, but Mars already knows her. So when he sees her on the bus, he can't believe his eyes. But Jana doesn't remember him. But she's really focused on what to do without Michael and how to get him into Dead School. 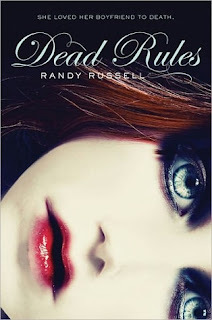 Dead Rules mainly focuses on Jana's death and how she can get Michael to die so they can be together. Yes, she loves him enough to kill him. (Eek). Jana even gets to attend her own funeral. Russell's whole take on this storyline was so interesting. I loved learning all the characters quirks. I loved how Mars and Jana interacted together, and I loved how he did look out for her best interest for the most part. Even though most of the students deaths were freak accidents, it was still fun to learn how they died and how they feel about being dead now. Overall: Dead Rules was an awesome book. It was so freaking interesting. I wanted to keep reading to find out what happened next. My eyes raised a few times throughout the novel and there were a few passages I had to reread a few times because they made me laugh. I'm so glad HarperTeen decided to publish this novel. They definitely hit a winner here. Cover: Love it! I love her eyes and her lips! Awesome cover! Sounds like a different take on high school romance. I love the cover too! I have a copy and can't wait to dig into it.